The Police said in Makurdi on Friday that Tse-Achia village near Kasar in the outskirts of Zaki Biam, Ukum Local Government Area of Benue, has been burnt. 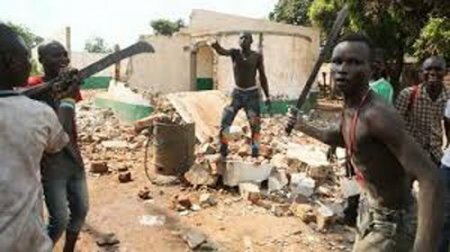 This is coming few days after Zaki Biam Yam Market was razed by hoodlums leading to the death of 17 people and 11 injured. The Police Public Relations Officer in the State, ASP Moses Yanmu, said the arsonists carried out the attack in the early hours of Friday. Yanmu said four houses were burnt while three persons, including a woman, were burned in one of the houses. He said the identity of the attackers was still unknown but assured that the culprits would be apprehended and brought to book. Yanmu said investigations had revealed that the driver that drove the vehicle that conveyed the people who attacked Zaki Biam was from the village. Gunmen had besieged Zaki Biam village in a Toyota car few days ago shooting sporadically and destroying things on their trail. The police said they were yet to fathom the motive of the attackers, but appealed to those with useful information that might lead to their arrest to volunteer it to security agencies.